President Trump has declared an end to the "war on coal." But coal country continues to grapple with powerful market forces that have crushed the mining industry. More evidence of coal's challenges came on Tuesday as Armstrong Energy, a western Kentucky coal company, filed for bankruptcy protection. Armstrong Energy is the first coal company to succumb to bankruptcy since Trump was elected nearly a year ago, according to the Institute for Energy Economics and Financial Analysis, an environmentally focused research group. It joins a long list of coal companies that have collapsed due to plunging demand caused mostly by cheap natural gas. Armstrong declined to say how many people it employs, but last month it warned it would lay off some of the 110 people that work at two of its facilities. Despite the bankruptcy filing, Armstrong said it's committed to "being a good employer" and will continue mining operations throughout the process. As part of the bankruptcy, Armstrong plans to transfer most of its assets to a new business owned by Illinois coal company Knight Hawk. Armstrong produces thermal coal, which has seen its demand drop due to power plants switching to cheap natural gas as well as renewable energy options like solar. Trump has sought to reverse that trend by ripping up environmental regulations and withdrawing the U.S. from the Paris climate accord. The Armstrong bankruptcy comes just a day after Trump cheered rising U.S. coal production on Twitter with the hashtag "#EndingWarOnCoal." Rather than Trump's deregulation, analysts say a recent uptick in coal production has been driven by higher exports to Asia and natural gas prices that have stopped plunging. In June, a coal mine in western Pennsylvania opened up, an achievement Trump celebrated at the time. Longer term, those who follow coal remain skeptical about Trump's ability to fix what are largely market-driven, not regulatory, challenges. "Him saving coal jobs was smoke and mirrors," said Andrew Cosgrove, senior analyst on global metals & mining at Bloomberg Intelligence. "It was never going to happen because low natural gas prices are the main problem. That will continue to cap any upside for coal." The abundance of cheap natural gas, thanks to the shale revolution, is the main culprit for the decline in domestic U.S. coal consumption since 2011, according to an in-depth Columbia University analysis published in April. 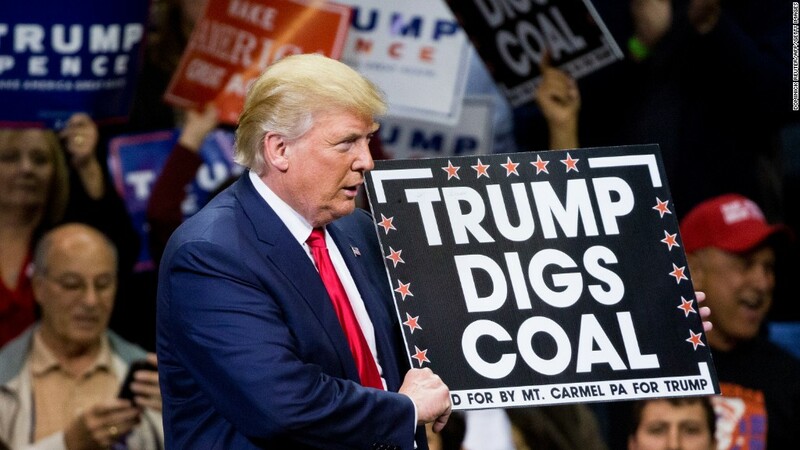 "It's not surprising coal continues to struggle because the decline wasn't driven by environmental regulations that this administration wants to scrap," said Jason Bordoff, a former Obama energy adviser who is now director of Columbia University's Center on Global Energy Policy. Armstrong may not be the last coal bankruptcy in the Trump era. In August, Murray Energy CEO Robert Murray pleaded with the White House to issue an emergency order protecting coal-fired power plants from being closed. Failure to do so would spark the bankruptcy of his company, Murray said. "Our time is running out," Murray, a Trump supporter, wrote. Trump's has promised to undo the Clean Power Plan, an Obama-era regulation that aimed to cut carbon emissions from power utilities, one of the largest sources of greenhouse gases. However, Bordoff argued it will take considerable time to cancel the Clean Power Plan, defend the deregulation in court and replace it with something else. Meanwhile, renewable energy keeps getting cheaper, creating more headaches for coal. The cost of electricity from solar has already cratered by nearly 75% since 2009, according to Bloomberg New Energy Finance. "Coal will continue to decline, even if you don't have the Clean Power Plan in place," said Bordoff.